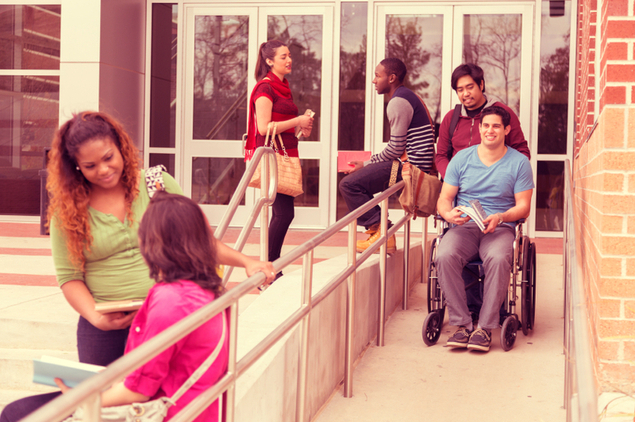 Be sure you know these college questions for students with disabilities. Does the registration process accommodate the disabled? If not, are there services to assist you? Does the school offer priority registration for the disabled? Are there academic counselors who are experienced in meeting the needs of disabled students? Are tutors provided for all subjects? Does the university bookstore have textbooks for the disabled? Is there a service to convert text to audio tape, large print or Braille? Is there a campus-wide sign language interpreter program or real-time captioning? What is the availability of these services? Does the school allow additional time on tests and exams? Does it allow other alternative testing formats like readers, writers, distraction-reduced environments or the use of tape recorders, computers and/or adaptive equipment? What kinds of career services are available? Are they accessible and relevant to disabled students? What percentage of the buildings on campus are handicapped accessible? Is there an office specifically dedicated to the needs of disabled students? How experienced is the staff there? How large is it? Does the college provide housing specifically for disabled students and/or personal attendants and housekeeping? How accessible are the food service and computer facilities? Does the university offer adaptive computer access? Do university computers have optical character recognition, speech output systems and/or Braille translators, embossers and keyboards? Is adaptive software available? What kind of technology support is there for students with hearing-impairments? Does the college provide telecommunication devices for the deaf, assistive listening devices, telephone amplifiers and visual alarms (i.e. smoke/fire alarms)? Are there physical training and/or functional training facilities on campus? What services do they provide? Is equipment repair available? Are there wheelchair loaner or rental services? Is there any financial aid available for students with disabilities? Are there any university/departmental scholarships for disabled students? Are students eligible to apply for loans or receive financial aid if they take a reduced load (less than full-time)? Is there a fee for services for the disabled? What percentage of the student population is disabled? Are there any disabled student organizations? Are there any varsity or intramural sports for disabled students? How accessible are the recreational facilities? What kind of counseling services are available? Are they accessible and relevant to disabled students? What kind of on-campus and off-campus transportation services does the university provide on the weekdays and on the weekends? What is the retention rate (how many disabled students come back after their freshman year)? How many disabled students have graduated from the college in the last few years? Also be sure to contact alumni and disabled students who are currently attending the school to get their advice. By finding a school that can meet your needs, both in and out of the classroom, you'll increase your chances for success. Special thanks to Bryan McMurray, Supervisor of Sensory and Testing Accommodations at the University of Illinois at Urbana-Champaign.